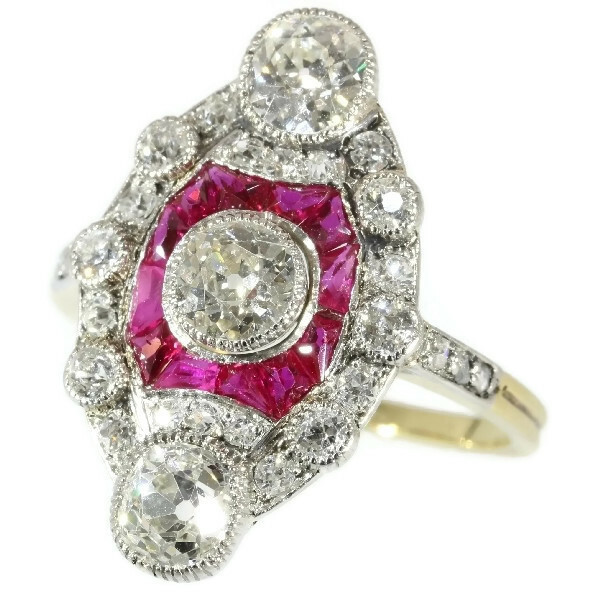 Stunning Belle Epoque Art Deco diamond and ruby engagement ring: Description by Adin Antique Jewelry. The design of this enchanting engagement ring in platinum and 18K yellow gold will prove you to be a jewel true to the Belle Epoque as well as the Art Deco style. A grand old brilliant cut diamond aligns from within a bulging square of 12 rubies with two old mine brilliant cut diamonds. With the support of a row of three diamonds, those two brilliants serve as the corners of a marquise shaped baté rim. Adding only even more depth to this design, each side of the rim consists of three elevated old mine brilliant cut diamonds alternating with four deeper encrusted diamonds. When even the settings of the three rose cut diamonds in each side of the shank are azure cut, it's clear that the craftsman of this piece from 1920 spared no expense in its making. Nor should anyone do so in convincing their dearest of their sincere affection. Style: Something between Art Deco and Belle Époque - Art Deco is an eclectic artistic and design style which had its origins in Paris in the first decades of the 20th century. The style originated in the 1920s and continued to be employed until after World War II. The term "art deco" first saw wide use after an exhibition in 1966, referring to the 1925 Exposition Internationale des Arts Décoratifs et Industriels Modernes that was the culmination of high-end style modern in Paris. Led by the best designers in the decorative arts such as fashion, and interior design, Art Deco affected all areas of design throughout the 1920s and 1930s, including architecture and industrial design, as well as the visual arts such as painting, the graphic arts and film. At the time, this style was seen as elegant, glamorous, functional and modern. - See also: Art Deco. Style specifics: This is something between Belle Époque and Art Deco. The Belle Époque (French for "Beautiful Era") was a period in European social history that began during the late 19th century from the Franco-Prussian War (1870-1871) and lasted until World War I (1914-18). Abstract motives and geometrical forms are quite typical for the Art Deco period. Art Deco moved away from the soft pastels and organic forms of its style predecessor, Art Nouveau, and embraced influences from many different styles and movements of the early 20th century, including Neoclassical, Constructivism, Cubism, Modernism, and Futurism. Its popularity peaked in Europe during the Roaring Twenties and continued strongly in the United States through the 1930s. Although many design movements have political or philosophical roots or intentions, Art Deco was purely decorative. Extra information: engagement ring - Especially in Western cultures, an engagement ring is a ring indicating the that the person wearing it is engaged to be married. In the United Kingdom, and North America, engagement rings are traditionally worn only by women, and rings can feature gemstones. In other cultures men and women usually wear matching rings, which can be plain. In some cultures, engagement rings are also used as wedding rings. Conventionally, the woman's ring is presented as a betrothal gift by a man to his prospective spouse while he proposes marriage or directly after she accepts his marriage proposal. It represents a formal agreement to future marriage. Rings can be bought by the man, the couple together, or by each partner for the other. In North America and the United Kingdom, it is worn on the left hand ring finger, while in Poland and Ukraine, it is customary for the ring to be worn on the right hand. In Germany, the ring is worn on the left hand while engaged, but moved to the right hand when married. Similar traditions purportedly date to classical times, dating back from an early usage reportedly referring to the fourth finger of the left hand as containing the vena amoris or "vein of love". Betrothal rings were used during Roman times, but weren't generally revived in the Western world until the 13th century. The first well-documented use of a diamond ring to signify engagement was by the Archduke Maximilian of Austria in imperial court of Vienna in 1477, upon his betrothal to Mary of Burgundy. Diamond(s): One (center) old brilliant cut diamond with an estimated weight of ± 0.55ct. (colour and clarity: H/I, vs/si). Two (outer) old mine brilliant cut diamonds with an estimated weight of ± 0.90ct. (colour and clarity: F/H, vs/si). 20 old mine brilliant cut diamonds with an estimated weight of ± 0.70ct. (colour and clarity: F/I, si/i). Six rose cut diamonds. We do not have the weight of the diamonds which is normal in our trade when it comes to rose cuts. Precious stones: 12 rubies . We did not check if these rubies are lab produced or not as this information has no influence on the value of this jewel. Natural rubies and lab produced rubies were both used in this era, rather more for their effect than for their intrinsic value.